Dubai International (DXB) welcomed more than 6.9 million passengers in April 2016 according to the monthly traffic report issued by operator Dubai Airports. Passenger numbers reached 6,978,268 in April, up 7.2% from the 6,510,653 guests who visited the airport in April 2015. During the first four months of 2016, DXB welcomed 27,926,958 passengers, compared to 26,116,977 passengers during the same period last year, an increase of 6.9%. n terms of percentage growth, Eastern Europe topped the list during April with routes to the region growing 12.6%, followed by Asia with 12.1% and the GCC with 10.3%. The Indian subcontinent outperformed all regions in terms of growth in passenger numbers with 1,644,045 passengers, followed by Western Europe with 1,533,558, and the GCC with 1,252,282 passengers. Total aircraft movements reached 34,733 in April 2016 up 4.3% compared to 33,279 during the corresponding month in 2015. In the first four months of the year, total aircraft movements rose 5.4 per cent to 139,079 compared to 132.005 movements during the same period in 2015. Dubai International recorded freight volumes totalling 213,790 in April compared to 204,075 in the same month last year, an increase of 4.8%. Year to date cargo totalled 828,934 tonnes, up 3.8% compared to 798,770 tonnes handled during the first four months in 2015. 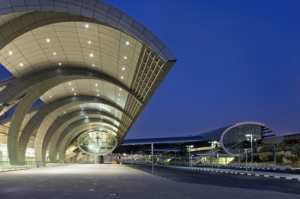 “We are very pleased with the growth so far this year and with the summer travel peak round the corner the numbers are only going to increase,” said Paul Griffiths, CEO of Dubai Airports. “As is the case every summer peak, Dubai International is expected to welcome a record number of passengers. We are actively working with our partners devising a robust operational plan which will involve the deployment of additional staff. We will also be launching a public awareness campaign to encourage passengers to follow our travel tips and show up early to the airport to enjoy all that we have on offer before boarding their flights,” he added.